Meanwhile, the economics of the case spawned a rather, well, let’s call it a rather spirited debate in the academic literature over the length of the conspiracy and the damages done. 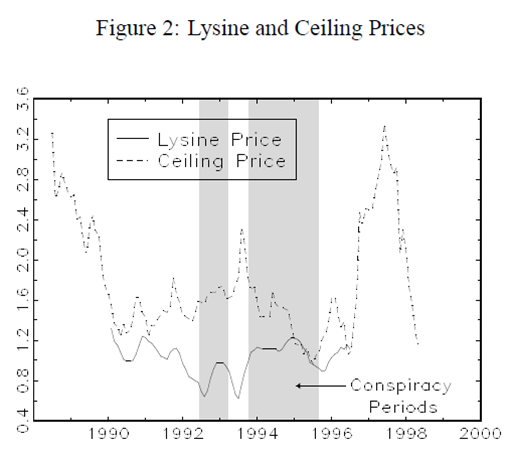 These are well documented in the sources below, particularly John Connor and Lawrence White, who trade body blows over the appropriate theoretical model, the appropriate choice of the conspiracy period, and the proverbial “but for” price (that is, the price that would have prevailed “but for” the conspiracy). Connor is sort of the go-to guy on these issues and he was profiled in the Chronicle of Higher Education about three weeks ago. Welcome back, students and faculty. Here is the full schedule for your perusal. It is worth contemplating for a moment a very simple and commonplace instance of the action of the price system to see what precisely it accomplishes. Assume that somewhere in the world a new opportunity for the use of some raw material, say, tin, has arisen, or that one of the sources of supply of tin has been eliminated. It does not matter for our purpose—and it is very significant that it does not matter—which of these two causes has made tin more scarce. All that the users of tin need to know is that some of the tin they used to consume is now more profitably employed elsewhere and that, in consequence, they must economize tin. There is no need for the great majority of them even to know where the more urgent need has arisen, or in favor of what other needs they ought to husband the supply. If only some of them know directly of the new demand, and switch resources over to it, and if the people who are aware of the new gap thus created in turn fill it from still other sources, the effect will rapidly spread throughout the whole economic system and influence not only all the uses of tin but also those of its substitutes and the substitutes of these substitutes, the supply of all the things made of tin, and their substitutes, and so on; and all this without the great majority of those instrumental in bringing about these substitutions knowing anything at all about the original cause of these changes. The whole acts as one market, not because any of its members survey the whole field, but because their limited individual fields of vision sufficiently overlap so that through many intermediaries the relevant information is communicated to all. The mere fact that there is one price for any commodity—or rather that local prices are connected in a manner determined by the cost of transport, etc.—brings about the solution which (it is just conceptually possible) might have been arrived at by one single mind possessing all the information which is in fact dispersed among all the people involved in the process. I’m just going through a backlog of interesting stories to share with my Econ 280 class. First up, Jonathan Adler points us to a short story on a residential subdivision’s successful legal challenge to the construction of a home windmill. The residents of a the Forest Hills subdivision just outside of Carson City, Nevada, argued that the proposed windmill would sully their sight-lines and provide interminable noise from the turning of the rotors. This is a solid example of what Shavell would call an ex ante property rule, and you can read all about it in the Las Vegas Sun. Speaking of benefits, the fall Journal of Economic Perspectives has another symposium on contingent valuation. Twenty years ago, Peter Diamond and Jerry Hausman famously asked, “Is Some Number Better than No Number?” Although Hausman seems to have found some clarity on the issue, I’d say for the profession the question remains unresolved. Catherine L. Kling, Daniel J. Phaneuf and Jinhua Zhao From Exxon to BP: Has Some Number Become Better Than No Number? Next up in the news, we have a consortium of cities and businesses is looking at a $200 million reservoir project to satisfy all its water needs, but it is contemplating paying rice farmers $100 million not to farm instead. Is this Coasean bargaining inevitable? I wouldn’t bet the farm on it. The costs of natural gas extraction include, paradoxically, all of the items listed as “benefits” in the two reports discussed above. Natural gas extraction requires labor, capital equipment, pipelines, and raw materials. These economic resources, in a fully employed economy, could have been allocated to other uses. The price paid to secure these resources from these other industries indicates the value of these resources to these other industries (had their value been higher, the market price would have been higher). Thus, the quantity of each economic resource times its market price – in fact 13 the total expenses by the industry as gathered in the surveys – represent the cost of utilizing scarce economic resources to gas extraction. This block quote is a battle we economists will probably never win. When I tell my students “jobs” are a cost not a benefit, they look at me as if I suddenly began speaking Swahili. The paper is from Ecological Economics, and an ungated version is available here. Amidst the hoopla of the triumphant release of Budweiser Black Crown, the King of Beers learned that its $20.1 billion offer to purchase Grupo Modelo — maker of Corona, that beer people put lemons in — had been given the kibosh by the good folks at the Department of Justice. This is the sort of product that matters to consumers. If you have a very slight price increase that happens because of this deal, it could mean that consumers will pay billions of dollars more. Now, reaching for the back of my envelope, the average American guzzles down about 30 gallons of beer per year, about a half gallon per week. Now, if the price per gallon goes up $0.10, that would entail about $3 per person per year times 300 million people, or about a billion dollars (assuming the demand for beer is pretty inelastic, of course). On the down side of all this consumer largess, young folks will probably be saddled with more STDs! Thanks you to the formerly bearded “Mr. T” for the tip. Those of you in the 400 class should take a look. Very interesting stuff. I’m currently stuck in the Sage basement due to poor door design. Attached is the assignment for today. Should someone come by, I’ll probably make it to class, but this way you’ll know I have the assignment done. As you know, or should know, departments must now offer a Senior Experience to fortify those of you who will be heading from this world into the next one. Here in economics, we actually provide you with two options. One is to augment a research paper,* and the other is to participate in a reading and discussion seminar — the Reading Option. For this year’s Reading Option, we will be taking on The Nature of the Farm: Contracts, Risk, and Organization in Agriculture by Doug Allen and Dean Lueck. Allen & Lueck — students of the great Yoram Barzel — lay out a transaction cost theory of farm organization, and then test this theory using mounds and mounds of data on farm contracts that they obtained from far and wide. Of central interest to Allen & Lueck is why, despite massive technological change, family ownership remains the dominant ownership form for planting and harvesting crops in America. Yes, you read that right. We are going to learn a lot about North American agriculture. Our group will meet Tuesdays 2:30-4:20 or thereabouts. Students should plan to read and think hard about one or two chapters per week, and will be responsible for writing a book review or some other short, crisp essay related to the course material. If you are interested in sitting in without taking on the entire “Experience,” you should see me. Sophomore and Junior majors are certainly welcome. Co-author Doug Allen will be on campus Thursday, February 14 to discuss his work and help you with your own, so mark that on your calendar. He will also give a public lecture as part of the Economics Colloquium. Those of you taking the course can check out the course Moodle here. For our first meeting on Tuesday, January 8, you should read the first two chapters, make sure to tackle the “economics vocabulary,” and be prepared to respond to the Fun Facts and Questions for Discussion. If you don’t know what these mean, you might try asking someone. If that doesn’t work, Google is your friend, as they say. I find the New Palgrave Dictionary of Economics to be an excellent resource (available to on-campus IP addresses). *See Professor Finkler for details. November 15th 11:10–12:20 What Money Can’t Buy, Chapters 4, 5. The reading for the first meeting (10/4) is 100 pages, and for subsequent meetings it is about 50 pages each. The first reading, Ethics, Efficiency, and Markets, is available for purchase as an online book, you can order used copies, or you can download it from this website: http://en.bookfi.org/book/1172337. The first chapter in that book is a short introduction in which basic notions are established; Chapter 2 will review several arguments that you will be familiar with from your economics classes; and Chapter 3 is the most significant for our discussion. Be prepared to state succinctly the moral arguments for and against the market. You have over two weeks to cover the 100 pages, which should not be too taxing. This first reading should give us some ammunition for our discussions of the second book. That, of course, is from Gore Vidal, 1925-2012. The clever graphic is one of Art Carden’s economic “memes” that has been circulating around in cybersphere for a day or two. The lesson, of course, is the law of demand — price goes up, people buy less; price goes down, people buy more. But Slate’s Matthew Yglesias steps up and says that maybe it isn’t so! Yet another possibility is that people hold total spending and total alcohol consumption (constant) and use the budgetary headroom opened up by cheaper beer to buy less beer and extra bourbon. So, let’s break this down. First off, total spending here is simply another way of saying the consumer has an income constraint. Second, the “budgetary headroom opened up” is the income effect from the price of a good in the consumption set decreasing. In other words, when the price of a good in a consumer’s consumption set falls, he effectively becomes richer because he can continue to buy his current consumption set, but now he has money left over to buy more beer, more bourbon, or more other activities. If we go ahead and assume that our consumer has convex preferences, our standard assumption, then we know that holding utility constant that when the price of beer falls, the substitution effect will indeed induce more beer consumption. But what about the income effect from the budgetary headroom? It’s possible that greater income leads to lower consumption of some goods (Ramen Noodles, bus rides, World Series viewings), and we call such goods inferior goods. 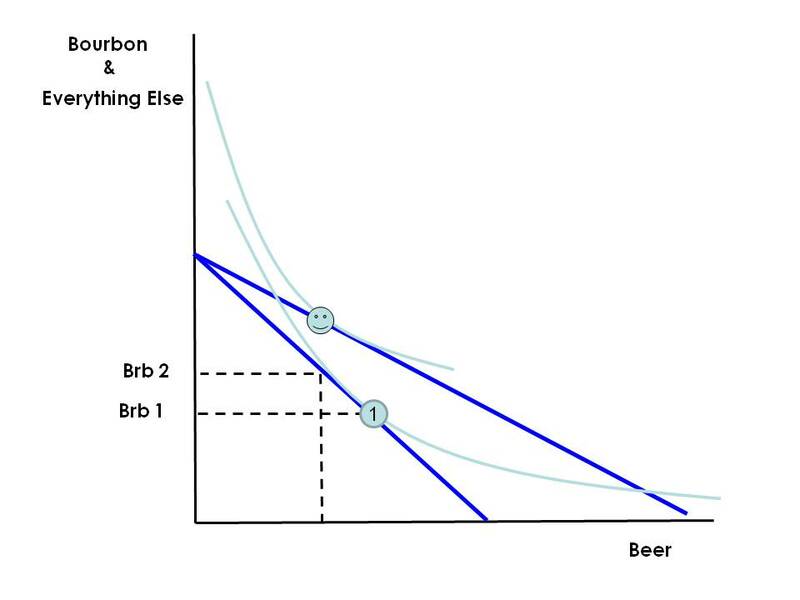 Anyone who has taken price theory knows that I don’t need three goods to get people to buy more bourbon and less beer — I simply need beer to be an inferior good that is subject to a really big income effect. That is, the price of beer falls, the substitution effect leads our consumer to buy more beer, but the income effect from greater budgetary headroom overwhelms the substitution effect. Beer is a Giffen good and we call it a day. Of course, economists have been looking for Giffen goods for a very long time, and there isn’t a long list, so maybe that isn’t the best route to go. So, let’s collapse this back down to a world where we have two goods: (1) beer and (2) bourbon and everything else, where the consumer is subject to both the income and the iso-alcohol constraint (linear combinations of beer and bourbon that lead to an equivalent level of insobriety). For visual simplicity, assume that initial income constraint is the same as the initial iso-alcohol constraint. That is, the relative price of beer and bourbon is the same as the relative weights needed to achieve some level of insobriety. Also for simplicity, assume that the consumer initially spends all his income on beer and bourbon. The optimal consumption set denoted by the circle with the 1 with bourbon consumption of Brb 1, where Brb 1 constitutes all spending on goods other than beer. Now along comes the decrease in the price of beer and all of a sudden we have a new budget constraint, one that pivots outward with the same Y intercept but a new X intercept. The potential consumption set has expanded. Clearly, the consumer can buy more than he bought before, and a new optimum consistent with less beer consumption is illustrated by the smiley. Because the consumer wants to maintain the same level of alcohol consumption, the amount spent on bourbon has to be on the original budget constraint — in this case the distance Brb 2 represents the amount spent on bourbon and the amount necessary to maintain that level of alcohol consumption. The distance between Brb 2 and the smiley is the amount spent on other stuff. As you can see, Yglesias’ possibility collapses to the observation that “beer could be a Giffin good.” In other words, not likely at all. It’s probably worth noting that the iso-alcohol constraint is problematic in its own right, as it implies a minimum level of consumption that might not be viable in a world where the price of beer and bourbon go up, or income decreases. In our example if the consumer is initially exhausting his income on beer and bourbon, any price increase or income decrease has the unhappy result that the iso-alcohol constraint cannot be satisfied. Thank you to loyal reader Mr. P for the tip. It looks like the In Pursuit of Innovation crowd is at it again, this time trotting out the revolutionary new Flickey app. Check out the This is Lawrence video currently featured at the LU homepage for the transformative nature of some of these I&E projects. And, if you happen to be the ambitious type, you might consider taking ECON 211 / PHYS 201 this fall — perhaps you will be next year’s feature from the thought to action crowd. Alright, I still don’t have an accounting of our numbers (and I’m not even listed as an instructor), but it’s time to start talking about Wapshott’s Keynes Hayek book. First up, roll call. Who are Edgeworth? Marshall? Mises? Menger? Robinson? Kahn? Second up, what do we know about the personalities of Keynes and Hayek? Do they remind you of anybody? Do you think the recent rap videos are accurate characterizations? (see, for example, p. 48). Third up, let’s revisit some basics — what is meant by “capitalism” and “socialism”? A continuing question: What is Keynes view of government? As you answer this question, think of (1) his reaction to the war reparations and his characterization of the likes of David Lloyd George and Woodrow Wilson; (2) the Bank of England’s decision to raise lending rates in 1923 (p. 32); (3) Britain’s decision to return to the gold standard (pp. 39-40). In each case the government made what Keynes considered to be disastrous decisions, yet at the same time he believed the “he maintains the belief that the government or the Bank of England should manage the economy. Does Keynes believe that the British government as an institution is fundamentally sound, but that they just need better economic advice? The second point above, evidently, was the beginning of the Keynesian Revolution (p. 32; read footnote 3). Does that surprise you? Another continuing questions: what is meant by “laissez faire”? The simple answer would seem to be that there is “limited” government intervention. Yet, the Bank of England sets interest rates, the government must make fundamental decisions about the currency — whether or not to adopt a “gold” standard, whether to have a central bank, whether to have a national currency, whether or not to tie that currency to precious metals (e.g., a gold standard or a “bimetallic” standard). What would constitute laissez faire in these contexts? As a follow up to this question, on page 43 Wapshott argues that the battle lines are drawn: Keynes believes in using the government as a means to help the disadvantaged, Hayek sees intervention as futile. Again, given what’s going on in these previous two paragraphs, is this characterization too simplistic? To what extent does Keynes’ advocacy (ideology?) affect his analysis? Consider his discussion of sticky wages and unemployment on p. 60. What is the effect of fixing the price of currency to gold on the general price level and on the exchange rate? (see, for instance, pp. 38-9). What is the “natural rate of interest”? (see, for instance, p. 43). That should get us through the first hour. See you at 3:25 in Steitz. 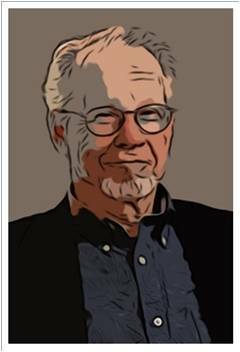 For those of you with some extra spare time, reviews from Tyler Cowen, Peter Lewin (UT Dallas), and Brian Doherty (Reason magazine), and here’sNicholas Wapshott talkign with Russ Roberts (including beau coup resources at EconTalk). This term’s economics read, DS 391 Keynes Hayek and Other Dead Economists, triumphantly kicks off this Thursday at 3:25 in Steitz 230. You should pick up Wapshott and read the first six chapters (pp. 1- 94). We will circulate discussion questions Wednesday. Next week we will continue down the Keynes Hayek track, and also begin with the Buchholtz chapter on Keynes. It’s not too late to join, and you can pick up sign up sheets from Professor Galambos or Gerard. Here’s some deep background from EconStories.tv. And, so we wind down another term, and I wonder what exactly is on your mind. So, for starters, let’s start with Backhouse & Bateman’s characterization of Keynes. What does Keynes see as capitalism’s defect? What does it “Say” about how his thinking diverges from the status quo at the time? Now, once we have the defect, is that defect the same type of difficulties that Tyler Cowen and Erik Brynjolfsson and Andrew McAfee are talking about? Or, put this another way, do Cowen and Byrnjolfsson & McAfee identify the same fundamental defect in the capitalist system that Keynes did? Once we establish that, let’s get at how Keynes proposed to deal with capitalism’s basic defect. What was his stance in The General Theory? (Digression: How did Keynes view of this change over time? What is the basic thesis proffered up by Bateman and Backhouse?). Next, is this way of addressing that defect likely to be of use in addressing the types of problems that worry these other authors? On that note, if you haven’t done so already, I suggest that you read one of Paul Krugman’s greatest columns ever, “The Accidental Theorist.” I love this column and use it often. I wish I would have suggested it when we read Brynjolfsson and McAfee. What does this article imply about the troubles that Cowen and Byrnjolfsson talk about? What does it suggest about Keynesian economics?